A bonus breakfast day. My weekends are usually shot working noon to midnight on Saturday then 10 AM to 7 PM on Sunday. There’s not much time for J and I to hang out, but this weekend, we got a little extra time. Instead of going in at 10 AM, I didn’t have to be in until noon. It’s only a couple hours, but it’s enough time for us to go out for breakfast. I didn’t want to go too far from home due to the impending storm and the fact that I still had to get to work. 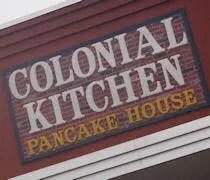 J threw out a couple options, but I wanted to check out the Kalamazoo location of the Colonial Pancake House. It’s not a 100% new restaurant to us. We did eat at the Portage location last summer. We both were happy with the meal and, more importantly, it was quick. 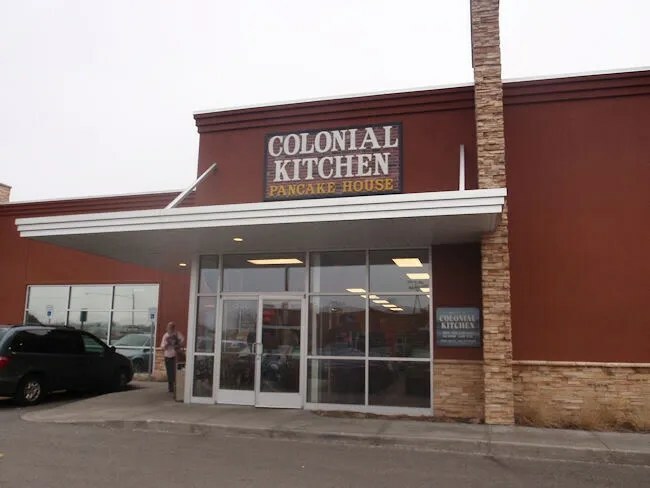 The Kalamazoo location of Colonial Kitchen is on Drake Avenue just south of Main Street in the Westwood Neighborhood. It shares a building with Big Deal Sports Bar in a small commercial development. Colonial Kitchen was the only thing open and the parking lot was packed, but I didn’t see a line at the door. I guess we just beat the rush…again. The restaurant is set up like the typical breakfast joint. They pack tables into every possible space and almost every table was full. We were met by a hostess who was looking over the partions to see if there were any open tables. She finally spotted one. A booth along the windows in the bottom of the L-shaped dining room. The waitress that was working our section was actually at the table right next to us when we sat down. As we were getting situated, she turned around and asked about drinks. I was happy to see Pepsi on the menu, so I got one of those and J got an Iced Tea. I was contemplating ordering off the lunch menu, but it’s Sunday. You have to eat breakfast on Sunday. I ended up with my old standby. The steak ‘n eggs. The steak is an 8 oz. New York Strip that I asked to be cooked medium rare. It came out with nice cross hatched grill marks, but a little more done that medium rare. The 8 oz. 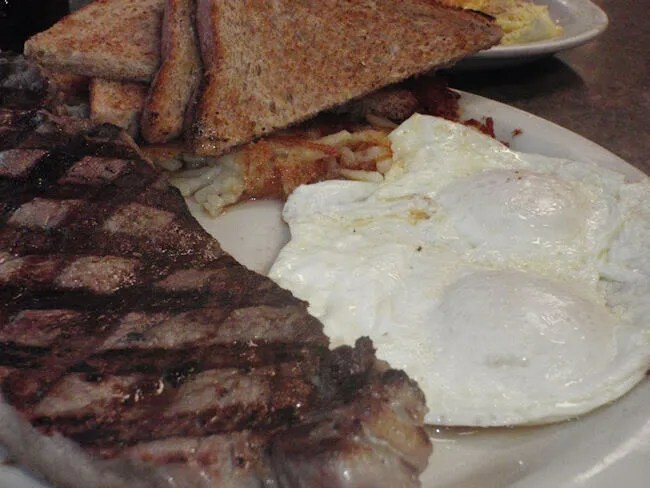 is a perfect breakfast size and the steak had a great seasoned and somewhat salty taste to it. The eggs I had done over medium and they were pretty runny. Steak and runny eggs….mmmmmm. I think that’s the reason I like steak for breakfast. The plate also included four pieces of wheat toast and hash browns. J took a few bites of the potatoes and said they were delicious. They were cooked all the way through which is really how she likes them. J ordered a cheese omelet, but had to make a few changes. The standard omelet is six eggs which is way more than she could actually eat. She “downgraded” to a three egg omelet made with egg beaters. The three egg omelet turned out to even be too much for her. 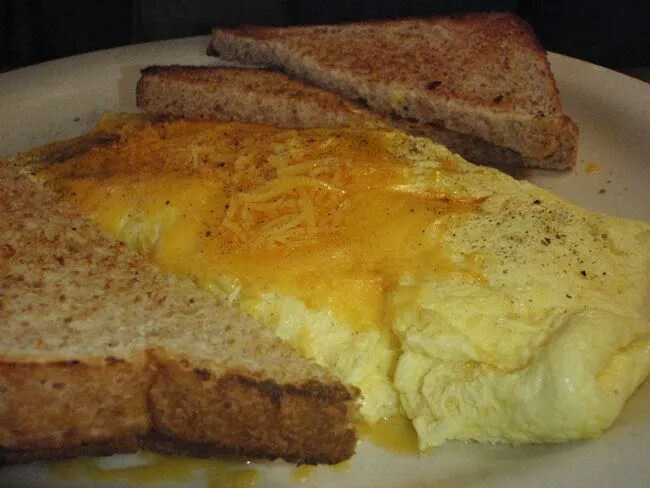 The omelet was very cheesy and she said it was good, just too much for her to eat. Her plate came with four pieces of wheat toast as. Our bill was a little over $21. Again, my fault with ordering the steak. Just like our trip to the Portage location, our meal was delicious, it was quick, and we were home before the storm hit.